Join our Affiliate Program to promote Driver Easy. Earn more if you sell more. Our affiliate network is powered by Avangate. 2) Fill in your information as instructed and then hit the Create my account button to continue. Then follow the prompt on your screen to continue. Note: You should enter the valid and correct information carefully when signing up because you can only use your email to sign up once. 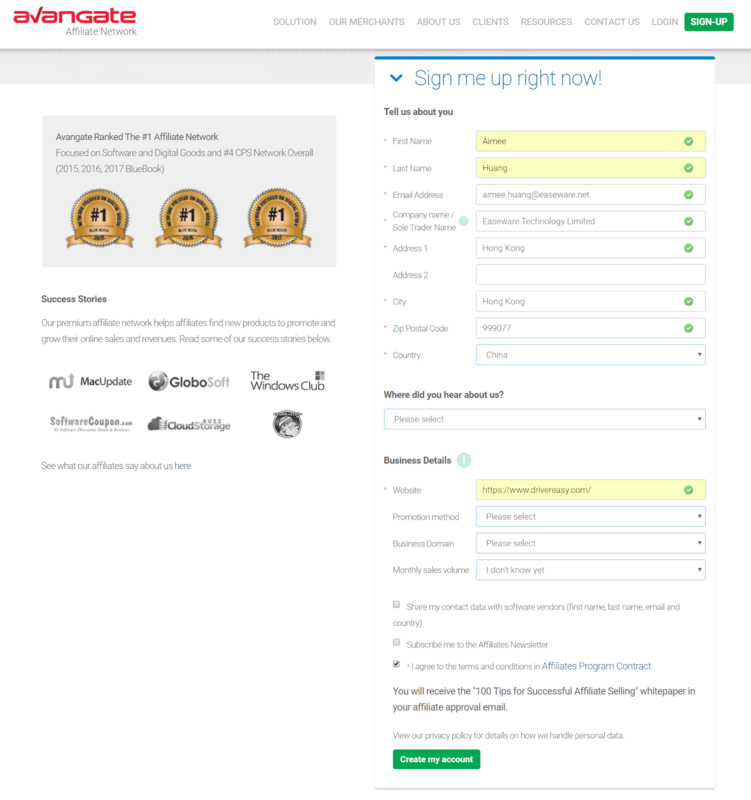 3) You will receive 3 emails from Avangate Affiliate Network to complete your registration. a) Click the included URL to verify your registration in the first email. b) Avangate will send you additional information after verification in the second email. c) You will need to provide some information regarding your current affiliate business in the third email as shown in the screenshot below. Note: To minimize the review time, you should provide as much detail as possible for the points mentioned in this email. Step 2: Get your unique Affiliate links and marketing materials. 1) Log in to your Avangate account. 2) Click the Find partners tab. 3) Type Driver Easy in the Search box and hit the Search button. 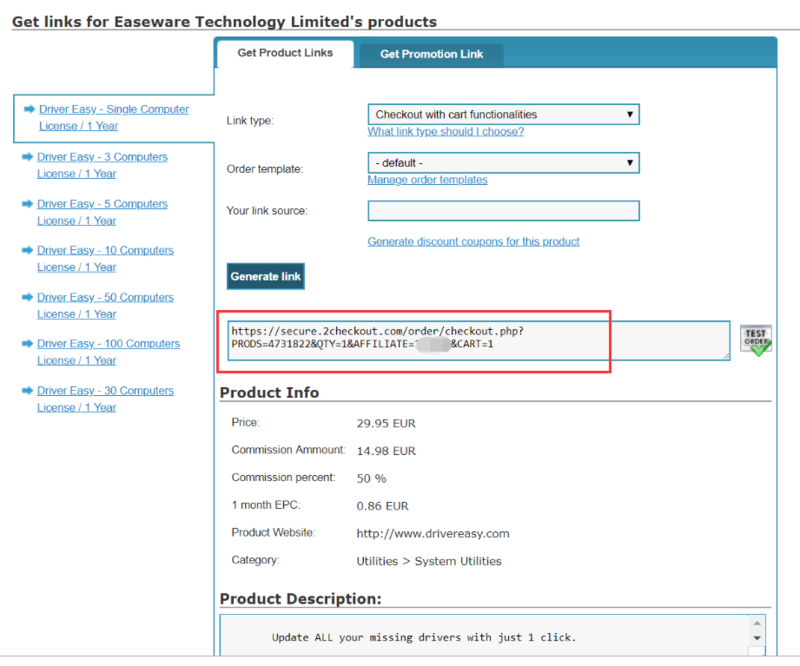 4) Easeware Technology Limited option will display under the Vendors tab. Click Request partnership link if you see No partnership. 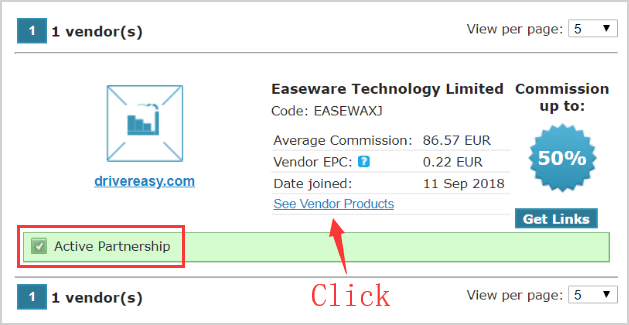 5) Click the See Vendor Products link when it becomes Active Partnership status. 6) Choose the products that you are interested in and click Generate link. 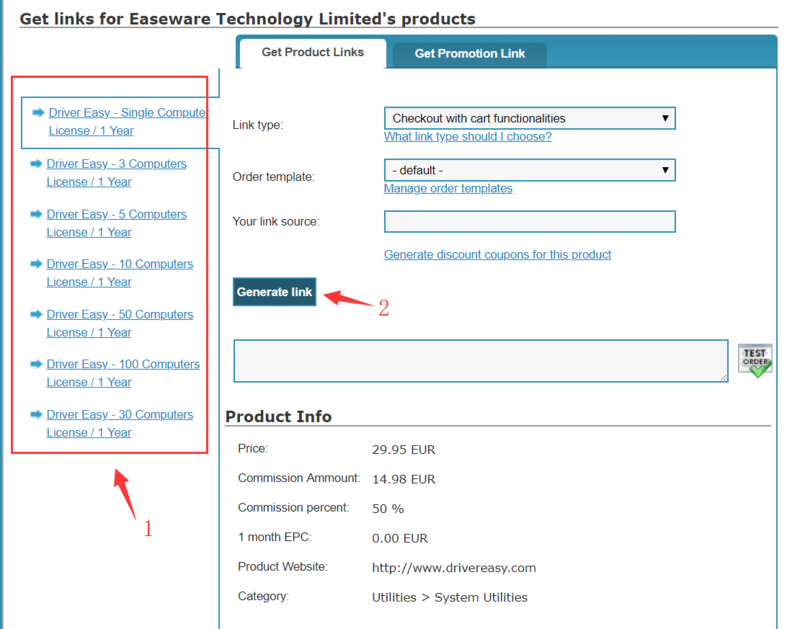 7) You will be able to see the sales link for the product you choose. Feel free to copy the information available here. Note that you should change the 123456 here to your affiliate ID. This download link keeps track of your affiliate ID information. As long as the users are from your side, whichever web pages they finally place the order, you will always get the final share. You can download the logo, screen shots, packing boxes and information as such of Driver Easy from Press Kits. When customers complete a purchase on your website, you will get up to 50% of order value! 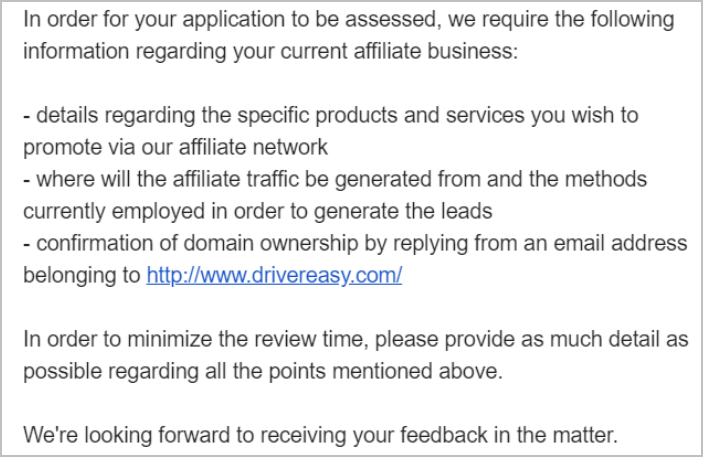 If you can sell license keys for more than 100 PCs per month, please feel free to contact us at support@drivereasy.com for the custom version of Driver Easy. To better track the orders and guarantee your commission, you can use this powerful affiliate tracking link based on your needs. AAA: specifying your affiliate ID. BBB: specifying the payment platform ID. The platform ID for Regnow/MyCommerce is 1, and the platform ID for Avangate/2CheckOut is 4. 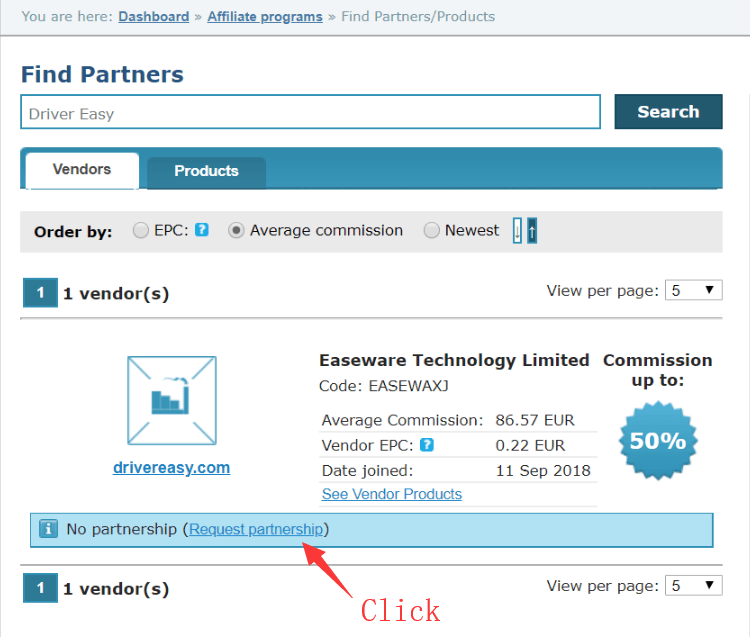 If you sign up the affiliate program on Avangate, you should enter “4” for this parameter. DDD: specifying the URL to track the source page for an order. It’s customizable and optional.